Domonic Brown, who was on his way to the All-Star Game as a prolific power-hitting Phillies outfielder four years ago, made his professional pitching debut on Saturday night (early Sunday morning?) in Albuquerque. In case you missed it, and unless you’re keeping tabs on Triple-A’s Pacific Coast League in the middle of the night on a Saturday night, you probably missed it, Domonic Brown pitched in a baseball game this weekend. The former top Phillies prospect and one-time All-Star, Brown is in Triple-A with the Colorado Rockies this season. He’s hitting a respectable .288 in 33 games, but with a .316 OBP and just two home runs. One of those home runs came on Saturday off Tyrell Jenkins, another former top prospect who is with his fourth organization (San Diego/El Paso Chihuahuas). 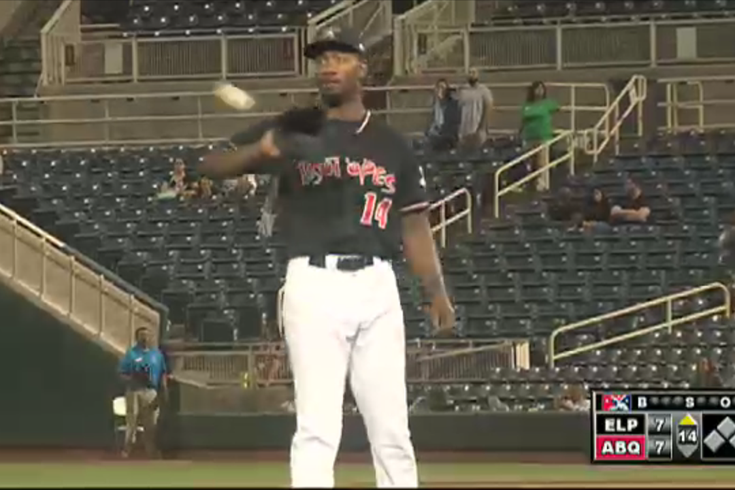 Brown’s solo shot off Jenkins in the fourth inning gave his Albuquerque Isotopes a 4-0 lead. 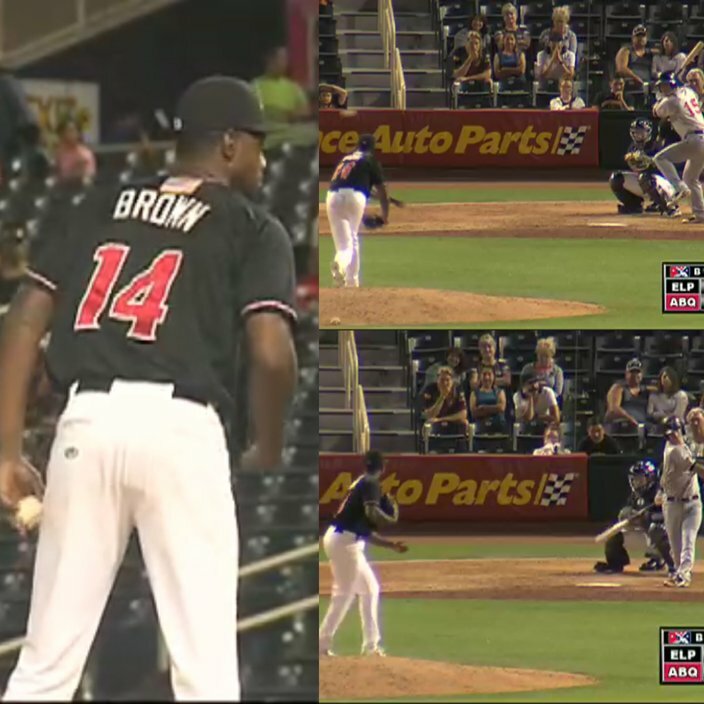 The game – with the two teams combining for 23 runs on 43 hits – pretty much went off the rails from there, culminating with the 29-year-old Brown taking the mound for Albuquerque in the 14th inning of a 7-7 game. Unless he dabbled with pitching in an offseason sandlot league at some point, this was Brown’s first time on a mound in more than 11 years, since he was a labeled a high school prospect with “unlimited potential” and “high upside” back in 2006 at Redan (Ga.) High School. Brown gave up a broken-bat single to begin the 14th inning before jumping ahead 1-2 to the second hitter before yielding a single through the right side of the infield. But then he lost it, walking the third batter of the inning on four pitches before serving up a two-run, opposite field, go-ahead double to El Paso’s Rafael Ortega. After allowing his third single, Brown exited. The pitcher that followed – fellow position player Rosell Herrera – immediately served up a three-run home run to Ryan Schimpf. Brown, the Isotopes’ ninth pitcher of the night, in a game started by rehabbing Rockies starter Jon Gray, did not retire a batter. He was charged with five earned runs on four hits and a walk. He threw 14 of his 25 pitches for strikes. If you have a MiLB.TV account (I recommend it because it's pretty inexpensive and watching Phillies prospects is probably preferable to watching Phillies major league games), you can watch Brown's pitching performance in its entirety through the app. Although it’s hard to rule out anything for a 29-year-old spending his second straight year at Triple-A following a half dozen years in the big leagues, it doesn’t appear likely that Brown will reinvent himself as a full-time pitcher. Aww, man. Domonic Brown, who pitched as a top prospect in high school, broke two bats and got a swing-and-a-miss in his pro pitching debut. But he also didn't retire a batter and was charged with five earned runs. It’s hard to believe it was only four years ago that Brown (once labeled a better prospect than Mike Trout) appeared to be coming into his own as a prolific big league power hitter ticketed for the MLB All-Star Game at Citi Field. Brown made his only All-Star appearance in July of 2013, following a ridiculous six-week period (April 27-June 8) when he hit .325 with 17 home runs in a 39-game stretch. After slashing 325/.346/.728 with 17 homers in 39 games/151 at-bats over that six-week period in 2013, Brown would go on to slash .239/.321/.364 with 23 homers over the course of 933 at-bats in his final 284 major league games. Strangely enough, Brown became the fifth position player from the forgettable 2015 Phillies to have pitched at some point in their professional careers. The others, for trivia with your friends: Jeff Francoeur, Brian Bogusevic, Andres Blanco (earlier this month with the Phillies), and Carlos Ruiz (earlier this month with Seattle). The Phils meet up with Chooch in Seattle tonight. One more former Phillies/minor league baseball note: Pawtucket right-hander Kyle Kendrick is on tap to start against the prospect-packed Lehigh Valley IronPigs lineup on Wednesday night at Coca-Cola Park in Allentown. The 32-year-old Kendrick is 2-4 with a 6.94 ERA in 10 starts with the Red Sox Triple-A affiliate this year.